Ranked 50 in Executive Education worldwide by the Financial Times 2014, the International Stream route of the Henley Executive MBA is delivered through a blend of annual week-long face-to-face workshops, peer group learning team activities, online and through individual and group study methods. Throughout the triple accredited program, candidates study and share experiences with similar experienced professionals from a wide variety of industry and cultural backgrounds. The course curriculum aims to develop participants' strategic, holistic and integrated perspective of business and management, as relevant to their respective organisation. The lectures and distance learning study materials integrate theory and practice through an approach that combines academic rigour with practical study. There are numerous opportunities for personal development through business coaching and mentoring, which enable candidates to lead and inspire their teams. For more information about Henley Flexible Executive MBA (International Stream) , please submit an information request below and the school will contact you with further information. The international track of the Henley Flexible Executive MBA is suitable for experienced managers looking to develop their international management competencies. Most participants on this programme already have 9 years postgraduate work experience. Sharing your experience with fellow programme members enriches your learning. To learn more about admissions, please send an enquiry here. 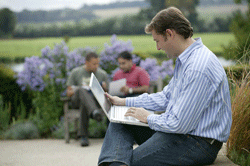 The fees for the Henley Flexible Executive MBA - International Stream are £18,500, which includes the £1,000 deposit. A variety of scholarships and bursaries are available for the Henley MBA programs. Relevant details are announced throughout the year. Stage one -You will gain a better understanding of the changing reality of management and leadership in the 21st Century and the role you play as a manager. There are three workshops which cover all the core modules in the first stage AND a compulsory MBA Starter Workshop. At the end of stage one and two, there are optional one-day workshops which help you prepare for the examinations. Fill out your details to find out more about Henley Flexible Executive MBA (International Stream) . The Henley MBA is a unique and meaningful experience - find out how you can gain personally and professionally by hearing the inspiring lecturers talk about their views of the students and course.